If by any chance you are a newbie in the field of HVAC vacuum pump industry, then you need a pump that will perform to your expectations. Even for those of you who would want to upgrade their available pumps, it is necessary that you make the right upgrade choice. For starters, you should know that the best HVAC vacuum pump with top class performance may not be available within your financial means, and the ones you can afford may not deliver the features you would want. Whatever the case, never compromise on features with money as you can still find a pump that meets both criteria. Buying the best pump may be a tough task especially when you are a rookie. The many choices available do not make it any easier. This comprehensive review will help you make the right decisions and get the best pump. 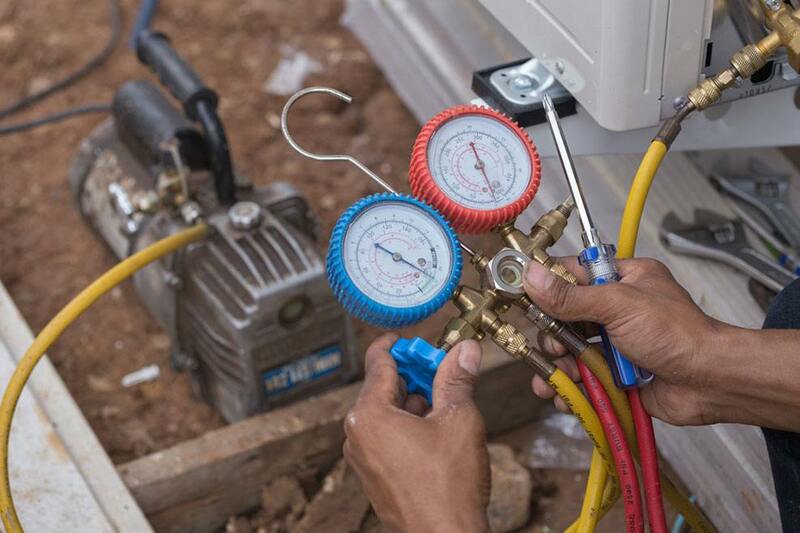 Where are hvac pumps applied? How to care for your pump? The capacity of a vacuum pump or any pump for that matter is measured in CFM (Cubic Feet per Minute). This is the ability of the vacuum pump to pull on a vacuum fast and efficiently. The higher the CFM a pump has, the faster it will be able to evacuate your HVAC system with minimal time wastages i.e. a 2 CFM pump will be better than a 1.2 CFM one. The capacity of the pump you choose is dependent on the “size” of your system. This is measured in tons. Here is an example; a 10-15-ton system may require a 2 CFM pump. A sight glass is used to check the level of oil in the pump. Constantly monitoring the level of oil in the vacuum is just as important as in your car. The sight glass should make it easy to check the oil level, not being too foggy or tainted to make checking complicated. A sight glass can eliminate the need for a dipstick. You simply look through the glass and see if the oil level needs topping or if it is okay. Most vacuum pumps tend to be very noisy as they run. You would not might this high noise levels when you are working out in the open. Noise becomes problematic when the work is to be done indoors. There are new pump models that reduce these amounts of noise so you can work inside the house. Also when you are working in a place where instructions need to be given as work progresses, you need the noise to be kept to a minimum. How much the pump you intend to buy weighs is a critical factor to consider. Some work demands a lot of mobility, so you will need a pump that you can move around to your workplace often. If the workplace is fixed, then you need not worry about the pump weight. A light pump will be very easy to move from point to point, unlike a very heavy one. As a Technician, you have a lot of carrying to do, do not add a pump to this list of hectic routines. The oil used by the pump is bound to become obsolete at some point. You then have to drain it before it interferes with the pumps internal rotating parts. The pump should, therefore, have a large opening to drain the used oil quickly. This valve should be located at the bottom of the pump and angled slightly. This allows for a quick and complete oil drainage. The motor drives everything in the vacuum pump. How much load the pump can withstands is the motor power and is measured in HP (Horsepower). Some types of jobs demand more horsepower than others, so you have to evaluate the varieties of the jobs you will be doing and choose an appropriate motor power. Some believe that the more power the motor has, the noisier it is. This is not the case sometimes. There are very powerful pumps which are also very quiet. Look out for such pumps. There some oil fill openings that are just too small. You end up really messed up in oil. Look for pumps with larger diameters for the o﻿il fil﻿l. Here are some five products that you should consider buying. 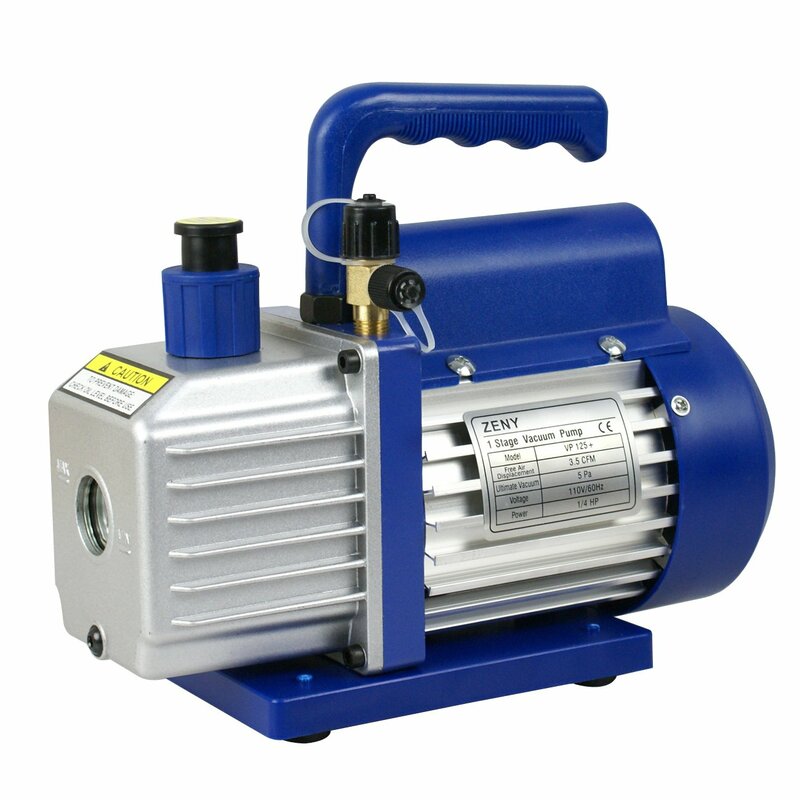 This vacuum pump is built for HVAC systems applications. It is fit for indoor applications due to the low noise it produces and is highly efficient. 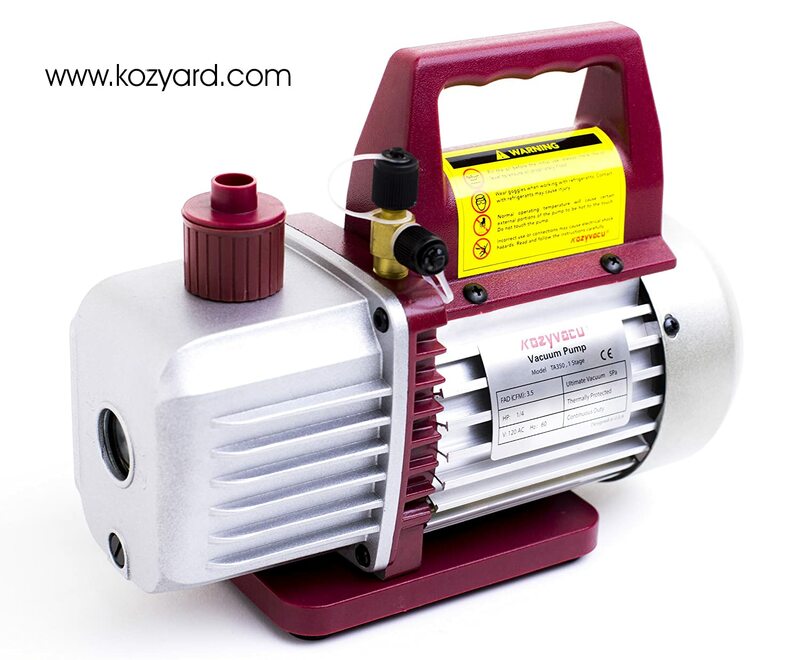 For durability, the pump is made of a heavy-duty casing of Aluminum alloy. Another great feature of this pump is its down facing oil drain valve that makes it easy to drain the used oil. To extend the product life, an internal cooling fan capable of delivering high volume of air is incorporated into the design. The motor has a direct drive for easy starting and eliminates the need for maintenance. The exhaust port has a cap to prevent backflow of exhaust gases. You don’t need to worry about the pump slipping through your hands as you carry it. A non-slip handle gives an assured grip. The inconveniencies of a dipstick is a thing of the past due to the presence of an oil slight glass to keep the pump oil levels in check. The Robinair 15310 meets high-performance standards synonymous with the brand. It delivers a power output capable of running a number of applications. It evacuates air at a rate of 3 CFM. This enables a faster and thorough evacuation. This pump features a downward angled oil drain at the bottom of the pump. This facilitates faster and more thorough oil drainage. An oil refill with a sizeable diameter makes refilling oil less messy and is accessible from either side of the pump. A sight glass located at the front of the pump indicates the oil levels so you can know when to top up or drain the oil. A high-performance motor delivers large amounts of torque to make an easy start up and smooth running. Aluminum is used to make these durable and lightweight pumps. This pump is no exception. The pump housing is made from cast aluminum for durability. This vacuum pump has been tested and confirmed to meet high-performance standards. It can, therefore, perform a wide range of applications. The high CFM delivered serves for quick and thorough evacuation. The Kozyvacu comes with die cast housing of Aluminum. The cast aluminum sheds a lot of weight off the pump and makes it durable in equal measure. The pump has the advantage of being easy to start and is freed from maintenance needs. Another feature you can look forward to in this pump is its thermal protected motor. It, therefore, runs for longer periods without breaking down because of thermal overload. Its oil drain valve is located at the bottom of the pump for easy and thorough draining. The port for oil filling can be accessed from any side of the pump. This is convenient when topping up the oil. This procedure can be really messy when the port is inaccessible. A sight glass is located at the front of the pump and indicates what levels the oil is at. The packing is molded from foam to absorb shocks during transportation. To prevent the pump from overheating, a high volume fan is built in for cooling purposes. 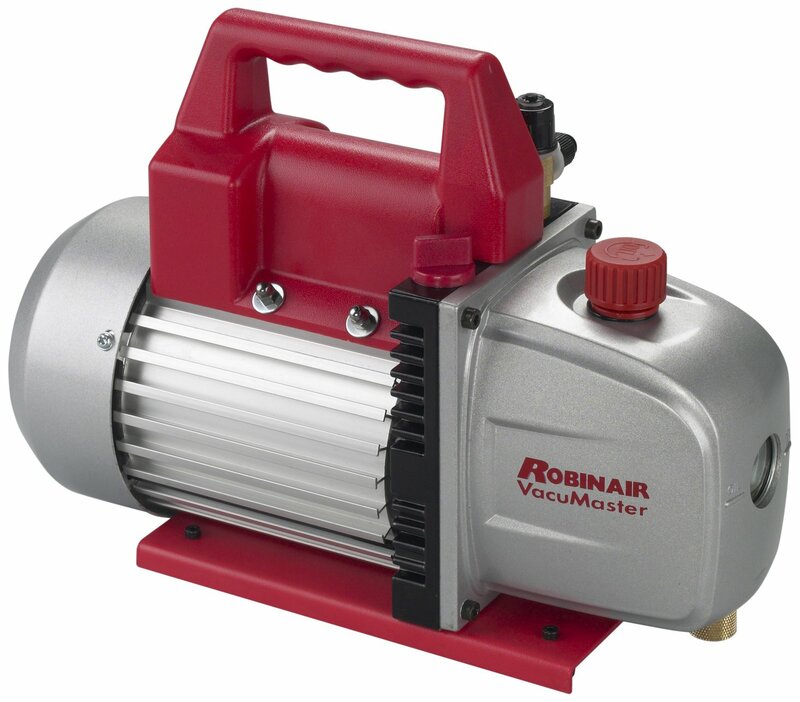 Robinair 15500 vacuum pump is a 2-stage design pump that is capable of thoroughly cleaning the system in two steps. The second stage ensures deeper vacuum levels of a system. This pump is capable of delivering 1/3 HP of power and has a rotary vane, the bearings are sealed for safety, and the motor produces high torque. All these when rolled into a single product, the result is an easy to start and highly efficient pump. This pump undergoes various tests to ensure it meets the high standards of performance expected from it. It is well suited for various HVAC systems applications. It is specifically made for air conditioning together with refrigeration applications. There is an improved service performance by the integration of rotary vane design for a more powerful, more vacuum capacity and an assured moisture removal ability. It has an improved pump capacity for minimized evacuation durations. The filtration serves a lifetime in preventing foreign materials from entering the pumping chambers. An internally mounted filtration system separates oil vapor and exhaust flows. A sure grip handle prevents the occurrence of accidents (it stays cool throughout the operation) as the exhaust air is directed from the technician. The TMS 3 CFM Single-stage Rotary Vane Vacuum Pump is a rotary vane pump suited for air conditioning jobs. It perfectly removes contaminants from the A/C systems. This pump stays for longer periods because it uses an internal fan for cooling during more extended working periods. An oil window is provided for checking the oil levels and quality. This makes your maintenance work very easy. 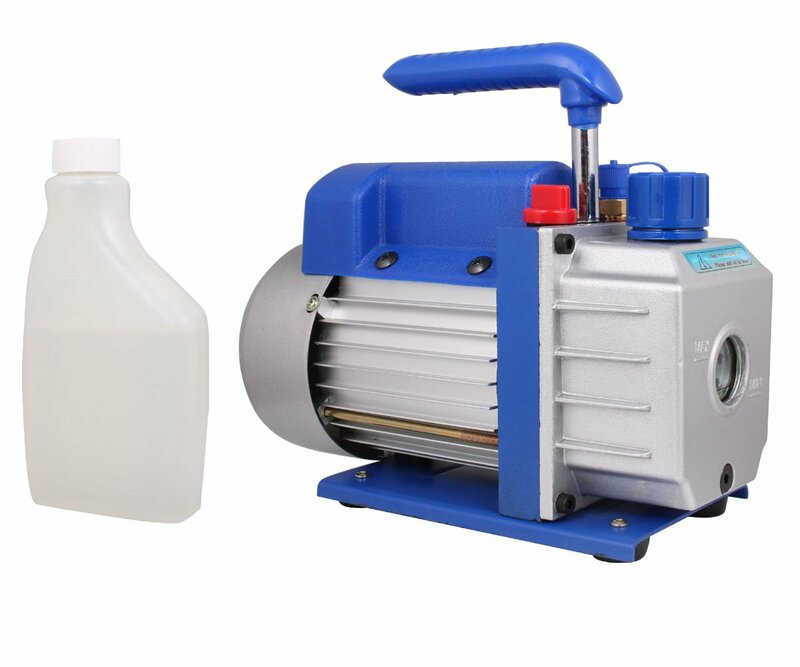 You can use this pump to seal jars for food preservation; it can be used for degasification, plastic hot forming, jeweler making, gluing jobs, printing machinery and air conditioning. A slip-free handle is made such that you have an assured hold as you carry your pump. For easy starting, a direct drive motor is used. A heavy-duty casing of Aluminum gives it durability and hard to crack protection. An enjoyable working experience is created by the low noise levels generated by this pump. These are some of the best pumps that will go a long way in assisting you in choosing the best HVAC vacuum pump for your needs. When deciding on the best product, make sure you make informed choices. Thoroughly scrutinize the features earlier provided, so you do not end up with an embarrassment in the name of a vacuum pump. Do not worry about your financial plans as you can find an equally capable pump that fits the plan. 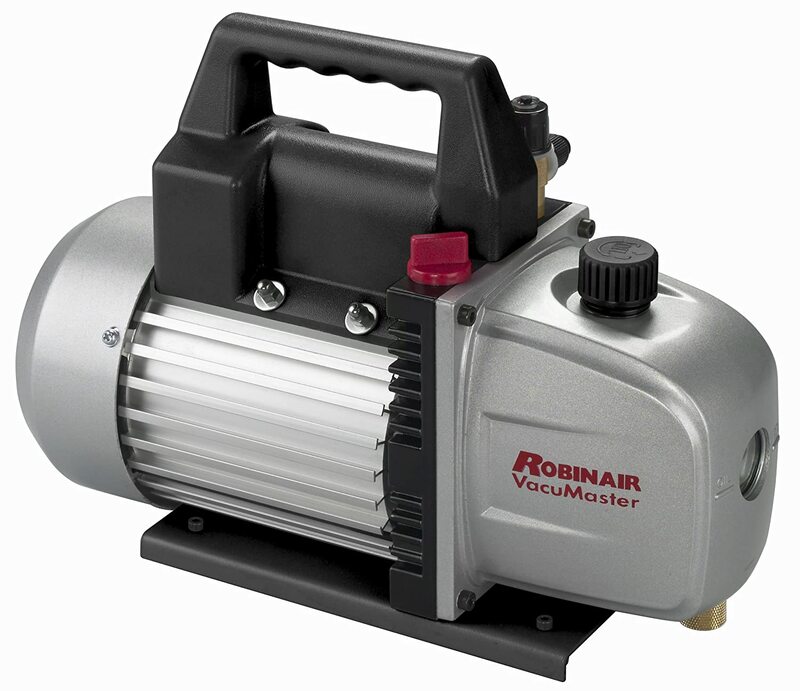 Just like any other review, there must be a product that stands out among the rest; in this case, the Robinair 15500 VacuMaster Economy Vacuum Pump stands out in this review. It has the highest CFM, which means you will be able to perform more power demanding services. Make the right choice and enjoy a smooth and enjoyable working experience.